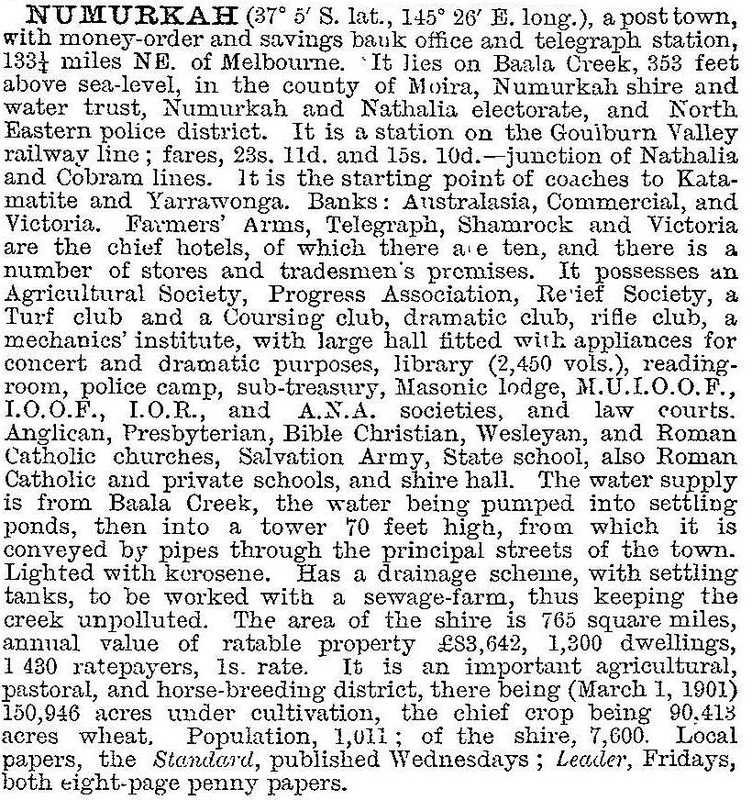 After the pastoral runs were made available for farm selection, the township of Numurkah was surveyed in 1875. The name is thought to be derived from an Aboriginal word meaning war shield, although a recent authority thinks that this is mistaken. Having grown from fewer than 100 people to over 1000 during the 1880s, Numurkah remained at about 1400 until the outbreak of World War II. The Numurkah district was just beyond the reach of inter-war irrigation schemes from the Goulburn Weir (1905) and the Hume/Yarrawonga Weirs (1936), although a small private irrigation scheme from the Broken Creek watered a 5 ha orchard which was a local showpiece. Farmers relied on dry-farming techniques in a variable rainfall environment of between 9 and 38 inches a year. In 1939 the Yarrawonga Main channel began carrying irrigation waters towards Numurkah, but work was delayed by the war until 1944. Resumption of irrigation works coincided with the settlement of demobilised soldiers in the Murray Valley irrigation area. In 1946 land holdings were acquired for subdivision into orchards 16 ha and dairy farms 49 ha, and irrigation and drainage channels were built. By 1956 the works were ending at northern-most Ulupna at the Murray River. Some immigrants who laboured on the works settled on the new farms. Numurkah is a service township for a rural community. Its secondary and tertiary industries are mostly limited to the town's service function. There are a secondary college (1951) and State and Catholic primary schools, three hotels, three motels, five churches, a saleyards and a showground. Local sports and recreation are provided for by a golf course, two ovals, a rifle range, a bowling green, tennis courts, a swimming pool and a caravan park. There are a hospital and elderly persons' facilities. A museum houses the local historical society and the courthouse (1889) is a registered historic building. Court operations ceased in 1986 and the building became a community learning centre. The hospital was damaged by floodwater in 2012 and was forced to utilise a series of tents and portable buildings. Funding to replace the hospital was committed in 2013. The caravan park, showground and golf course are on the south side of Broken Creek. On the other side there is the Numurkah Lake wetland, constructed in the 1970s. It suffered degradation during the 2000s drought, and the shire council has formulated plans for its restoration. Bushfire swept through Numurkah in 2014 destroying sheep and cattle, farm land and a number of houses. Also destroyed was the boardwalk, bird hides and 10,000 recently planted trees at Kinnairds wetland near Numurkah. A controlled flood was made to bring the wetlands back to life. The shire also contained Nathalia and the two towns had periods of an uneasy relationship until separation into two shires occurred on 31 May 1957. Numurkah shire's area was reduced by about 63% to 820 sq km. The shire contained the towns of Katunga, Strathmerton and Wunghnu and the localities of Baulkanaugh, Dranmure and Ulupna on the Murray River. 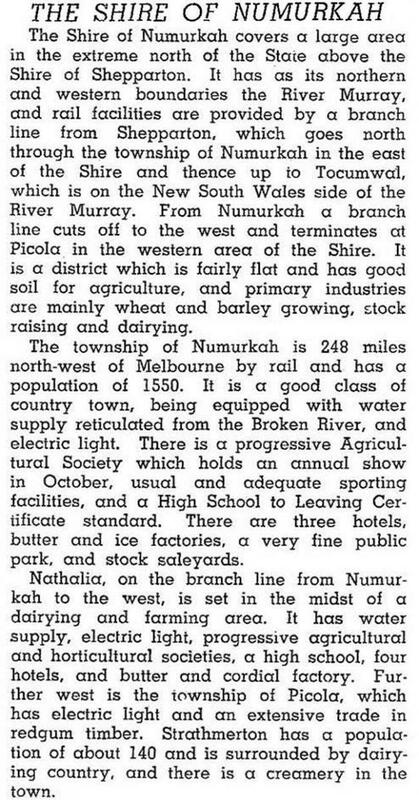 In 1994 Numurkah shire had 613 sq km, or 75% of its area, as farmland. There were 52,800 dairy cattle, 11,300 meat cattle and 35,000 head of sheep and lambs. The shire has sufficient retail floor space for its local needs. In 1985 there were 8100 sq metres, much larger than Tungamah (700 sq m), but less than Shepparton city (100,000 sq m). On 18 November 1994, Numurkah, Nathalia and most of Yarrawonga and Tungamah shires were united to form Moira shire.